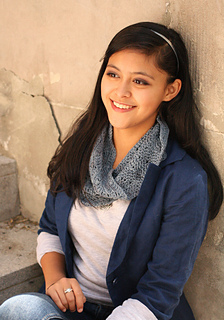 Simple crochet stitches, with an easily memorizable repeat make this cowl a quick and fun project. 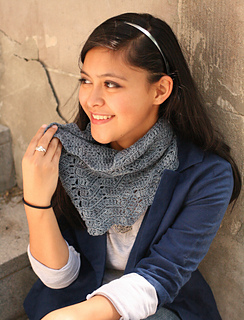 Work it in a drapey yarn for a sophisticated look. Yarn: 220 yards of DK weight yarn. Shown in Anzula Vera 65% Silk/35% Linen, approx. 365 yds in 4 ounces in Storm. Gauge: 18 sts & 8 rows = 4 inches 10 cm square in pattern after blocking. Finished sizes: 22 inches 28 cm circumference & 10 inches 25.5 cm tall. Hook: 5.5 mm I/9 or size needed to obtain gauge. Notions: tapestry needle for grafting and weaving in ends, stitch marker for beginning of round optional. Stitches Used: chain, slip stitch, double crochet, single crochet, double crochet increase, single crochet increase, double crochet decrease, single crochet decrease. All stitches should be worked in the back loop of stitches from the previous round. The pattern stitch text is the same as the chart, you can work from whichever you prefer. 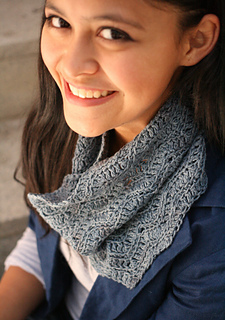 If you want a longer/shorter circumference cowl, increase or decrease the first chain by multiples of 10.